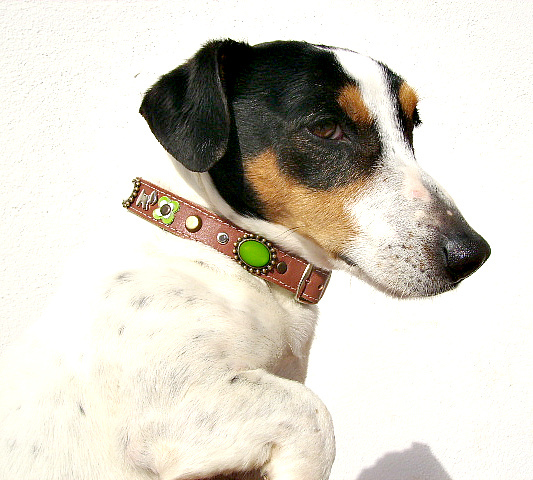 In this category “Kumpel” for small dogs you can buy your own designer personalised leather dog collar. Many of my designs I offer for dogs of all sizes; but especially for small dogs and sometimes other reasons, I always relate the design to the specific size and proportion of the collar. Superpipapo designs and manufactures all models itself. You always will find a broad selection of designs for small dogs for all tastes! If you cannot find anything right now, please visit me again! Measure the size of the dog’s neck before you order. How to do this you can find in the menu. The collars in this category are suitable for dogs with a necks size as mentioned below. Also you can see the size of dog collar itself!